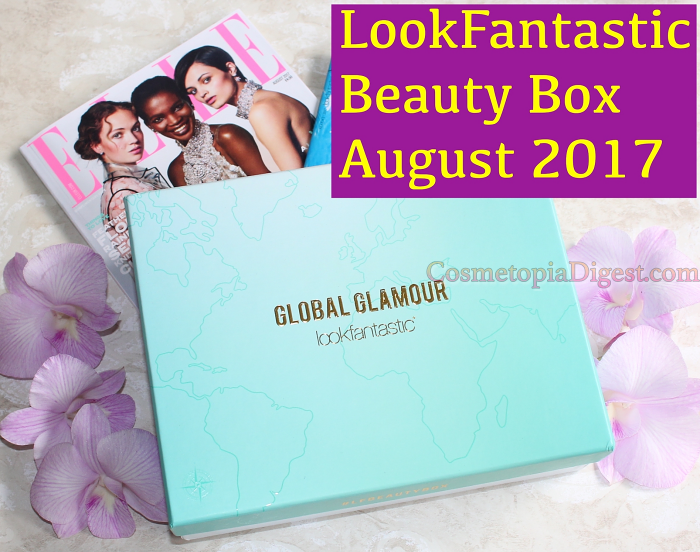 The theme "Global Glamour" indicates that the August 2017 LookFantastic Beauty Box contains travel essentials that will keep you looking good through your vacation. Being more of a skincare box, I didn't really expect an eyeshadow quad or a mini lipstick, but I knew there would be a good variety of minis I could stash into my suitcase. The box is mint-green with a world map outlined. It contains the month's Elle UK issue and the in-house magazine. Scroll down to check out what I received in the LookFantastic Beauty Box for August 2017. Here's my video unboxing. Please do subscribe, and do give me a thumbs-up! Not a bad box at all this month - just the one item I won't be trying out. The contents fit in well with the theme and my expectations, and they *just* escaped adding a black eye pencil! LookFantastic ships worldwide - go here to subscribe. A box costs £15, though long-term subs cost as low as £13 a month, and you don't have to pre-pay! September is LookFantastic's anniversary month, and I can't wait to see what they have in store for us!